CenterPoint Energy is reacting to video showing a contractor strike a Kingwood family's pets with a wrench. KINGWOOD, Texas -- CenterPoint Energy is reacting to video showing a contractor strike a Kingwood family's pets with a wrench. A man working for a Star Corp, a CenterPoint contractor, walks into a the Willcox family's backyard. 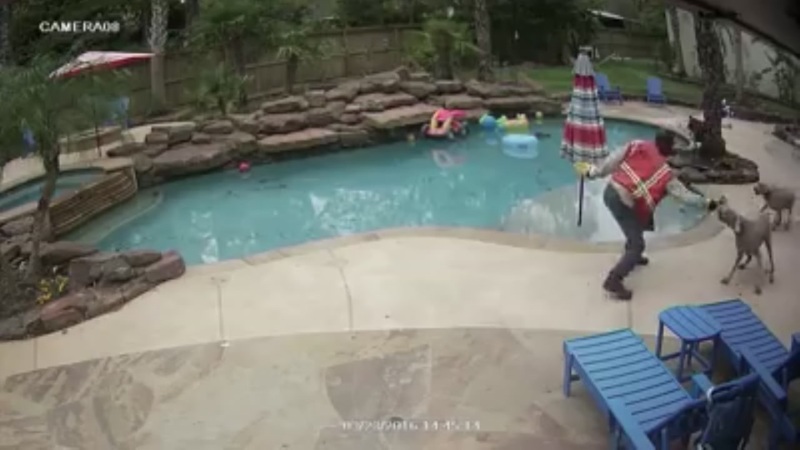 The video shows the man near the family's dogs. Then you see the worker strike the dogs numerous times with a wrench. After learning about what happened, homeowner Mike Willcox confronted the man. "I'm like, 'Why didn't you come knock on the door? We were home.' He's like, 'I don't have to do that,'" said Willcox. The contractor was disconnecting service. According to CenterPoint policy, in those cases, crews do not have to knock. However, CenterPoint Energy also called the video disturbing. "It absolutely would have made the best sense to knock on the door but our process today for disconnection for non-payment, it is to go straight to the meter. And, again, we're extremely disappointed about this behavior and how it unfolded," said Leticia Lowe, a spokesperson for CenterPoint Energy. CenterPoint said as a result of this incident, it is evaluating its practices and will talk to the contractor. The energy company said under no circumstance is it OK to strike an animal, even if the employee feels threatened. The employee is supposed to retreat, not hit the animal. As for the Willcox dogs, they're still recovering. One is getting surgery on his jaw this week. Willcox said CenterPoint called him Monday morning and offered to help pay his vet bills. The company also told Eyewitness News late Monday afternoon that the contractor was suspended.